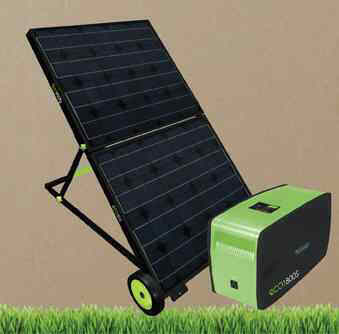 The Eco-1800S is a Plug and Play Solar Generator designed for ease of use. Plug and Play means you take the product out of the box, set-up the solar panel, connect the solar panel to the base unit with the 50 ft cord provided and the solar generator is ready to operate. The base unit includes a 12V, 60Ah SLA Battery pack (three 12V 20Ah SLA in parallel), an 1800 watt inverter and a charge controller so the consumer does not have to know how the individual components work together or spend time hooking up a complicated system. The product can be charged via AC or solar so ideally top charge the batteries after taking them out of the box so when you need back-up power the ECO-1800S is ready. The product is ideal for emergency back-up power, camping, tailgaiting, or anywhere you may need a remote power source. How long will it last? Depends on what they are plugging into the unit. Warranty – 1 year for the base, 5 years for the panels.